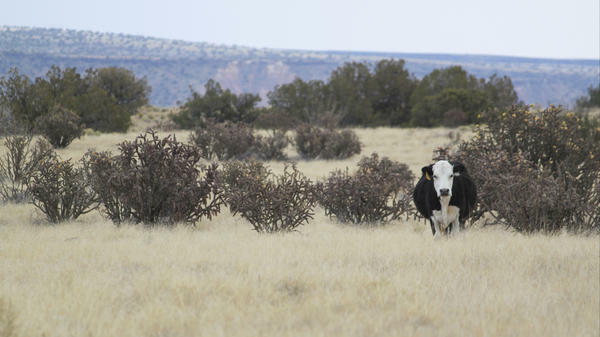 A cow grazes a stretch of open range north of Albuquerque, N.M. Many residents left Weed, N.M. starting in the 1980s when the sawmills closed. Today the few ranching families left say their livelihoods are threatened. Shirley Stone, 83, remembers when her hometown of Weed, N.M. was a thriving rural community. Today all the sawmills have closed, so did the school. Most ranching families like hers have had to leave. "People don't ride as much as they used to," Lewis says. Today you're more likely to encounter an ATV rider or camper or hunter than a cattleman tending to his beef cows. It's not like it used to be when Lewis was growing up and ranchers ruled the range in this corner of the West. "I taught school for a year and a half," says Lewis, who moved away from this area briefly when he was younger to get a math degree. "But it wasn't what I wanted to do, it ties me down, I want to live in the outdoors." In many ways, Terry Lewis fits that iconic image of the independent cowboy riding the West's vast, publicly-owned ranges. That image is woven tightly into American folklore and identity. A lot of cowboys built up their stock on U.S. public lands. But today the number of actual independent cattlemen working on these lands is dropping. A few years back, Lewis says he was forced to sell his cows. He couldn't afford to stay in business. The same goes for many of his friends and former classmates. "The way I have been able to do my life and own a ranch, I think that's gone for people like us now," he says. There are so many reasons for the decline: corporate consolidation of the cattle industry, drought, global economics to name a few. Today around Weed, there are only a few ranchers left trying to scratch out a living. Many who remain in business will tell you they feel like they're being squeezed off the land by economics and a changing culture, but also environmental laws such as the Endangered Species Act. "Rural America is down here suffering," says Gary Stone, a long-time rancher in Weed who helps run the Otero County Cattlemen's Association. Stone says when President Trump was elected, ranchers were hopeful that he'd help the small, independent cattlemen. The administration is rolling back a lot of regulations. But out on the ground, far away from the politics of the beltway, the cattlemen's optimism is fading. "We can't tell there's been an administrative change at the district and the regional level," Stone says. Like in most western states, there's more public land in New Mexico than there is private. Many ranchers don't own much actual land themselves so they lease federal public land from the government for grazing. One reason for all the anxiety is that the amount of land open to grazing has been cut steadily, by one closely watched estimate, down by more than half since the 1950s. Environmentalists like Matthew Koehler of the WildWest Institute want to see that drop even further. "As an elk hunter and a deer hunter myself, I can tell you that cows and sheep wreak havoc on our public lands," Koehler says. Koehler says ranching is simply more efficient on private land in states like Texas and the Midwest that have a lot more grass. Over time, the livestock industry has shifted in this direction too. Not even a fifth of all of the beef raised in the U.S. comes from western public lands today. But many environmentalists argue the cattlemen on public lands still get outsized attention and a lot of political clout. "I think some of it is the mystique of the Marlboro man and the cowboy and his cows," says Koehler. "I think it pulls at a lot of heart strings of people, even people living in more urban areas." Old time ranchers may conjure up this iconic image in our minds. But a lot of the smaller ones today are worried about becoming irrelevant. And that's the tension. Like Terry Lewis, Gary Stone too couldn't afford to stay in the business himself, so he started working as a foreman on another man's ranch. "It should be managed better," Stone says. "There should not be an agenda to discontinue grazing." Here on the Lincoln National Forest, which issues the grazing leases to local ranchers, the chief land manager, Travis Moseley, dismisses that as conspiracy theory. "I would be breaking the law," Moseley says. "Livestock grazing is a recognized use of national forest systems and until that law changes, it's my job to facilitate that use." "Multiple use" federal agencies like the U.S. Forest Service or the Bureau of Land Management are often seen as having competing – and sometimes contradictory – missions. How do you promote industry development while also managing for pristine public lands, the argument often goes. Moseley thinks a balance is possible. He also agrees that public lands ranchers are getting squeezed, just not due to stricter environmental laws. He blames an explosion of recreation on public lands recently: hikers and campers, hunters, off-road vehicle enthusiasts clashing with cattle herds and endangered critters. Fights over public lands have always been controversial in the West. There are still old wounds here over the "cattle free by 93" environmentalist campaigns against public lands grazing during the Clinton administration. Today, with even more people and pressures on the land, the fights over who should be able to do what, seem to be getting even tenser, with some spilling over into armed standoffs. "It feels like there's more polarization and less tolerance for each other's interest in how they use the national forest whether it's for wildlife viewing or livestock grazing," Moseley says. In New Mexico, the ranchers' frustrations are a slice of some of the broader economic anxieties you see in rural America right now. Their world is changing fast. What's happening in and around the tiny hamlet of Weed is an all too familiar tale for rural western towns that sprung up around a once reliable supply of lush range land and timber. "There's not any jobs to draw people to come in, the young ones especially," says Shirley Stone, 83, who helps run the Weed General Store and used to be the town's postmaster. Shirley Stone is Gary's mom. She remembers when Weed was a thriving town with hundreds of people working in the lumber and ranching industries. Today, the sawmills have closed. The school was shut down in 1992. "About all we have left is the post office and the café," Stone says. In one room of the old high school, Shirley Stone has set up a community library. In another, there is a make-shift museum, its walls lined with old high school basketball photos and state tournament trophies. The gym goes mostly unused. "It just nearly died when we lost our school, it just nearly died," Stone says. Folks worry that if the last of the cattlemen go, so goes what's left of their tight-knit little community. The romanticized image of a cowboy out on the Western range is woven tightly into American identity and folklore. A lot of old-time cowboys built up their stock on U.S. public lands. Today, the number of actual independent cattlemen and women working on publicly owned ranges is falling. NPR's Kirk Siegler reports from the mountains of southern New Mexico. 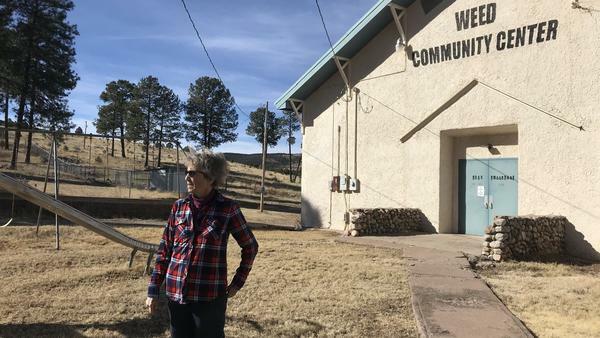 KIRK SIEGLER, BYLINE: Seventy-four-year-old Terry Lewis has probably ridden every trail, every gully and meadow you can find in the mountains around his boyhood home of Weed, N.M.
TERRY LEWIS: I taught school for a year and a half. I do have a college education with a math major, but that's not what I wanted to do. It ties me down. I don't want to do that. I want to live in the outdoors. SIEGLER: As we bounce along a dirt road in an old pickup, he laments the fact that a horse would make this trip so much quicker. LEWIS: It's harder to get to know our country if you don't do it horseback. SIEGLER: Today, you're more likely to encounter an ATV rider or a camper here than a cowboy on horseback. It's not like it used to be when Lewis was growing up and ranchers ruled the range in this corner of the West. A few years back, he says he was forced to sell his cows. He couldn't afford to stay in business. LEWIS: The way I have been able to do my life and own a ranch - I think that's gone for people like us now. SIEGLER: There are so many reasons why small, independent cattle operations like Lewis had are going away - corporate consolidation of the cattle industry, global economics, drought, to name a few. SIEGLER: Today, in the tree-covered hills around the tiny town of Weed, there are only a few ranchers left trying to scratch out a living. Many will tell you they're being squeezed off the land by economics and a changing culture but also environmental laws like the Endangered Species Act. GARY STONE: America - rural America is down here suffering. SIEGLER: Gary Stone is with the Otero County Cattlemen's Association. He says ranchers were hopeful when Donald Trump was elected he'd help the small, independent cattlemen so they could survive. The administration is rolling back a lot of regulations, but out here on the land, the cattlemen's optimism is fading. G. STONE: We can't tell that there's been an administration change at the district level and the regional level. SIEGLER: Now, most small-time ranchers in the Southwest don't own much actual land themselves. The range is publicly owned, so they have to lease it from the government for grazing. And the amount of land open to grazing has been cut steadily down by more than half since the 1950s. Environmentalists like Matthew Koehler of the WildWest Institute want to see that drop even further. MATTHEW KOEHLER: As an elk hunter and a deer hunter myself, I can tell you that cows and sheep - they wreak havoc on our public lands. SIEGLER: Koehler says ranching today is simply more efficient on private land in states like Texas and the Midwest that have a lot more grass. The livestock industry has shifted in this direction, too. Today, less than a fifth of all the beef raised in the U.S. comes from Western public lands. So why all the attention on these cattlemen? KOEHLER: I think some of it is the mystique of the Marlboro man and the cowboy and his cows. I think it pulls at a lot of heartstrings of people, even people living in more urban areas. SIEGLER: Ranchers may conjure up this iconic image in our minds, but a lot of the smaller guys today are worried about becoming irrelevant. And that's the tension. Gary Stone couldn't afford to stay in the game himself either. He now has to work as a foreman on another man's ranch. G. STONE: It should be managed better. There should not be an agenda to discontinue grazing. That's what we feel like is there. SIEGLER: Here on the Lincoln National Forest, the chief land manager, Travis Moseley, insists there's no agenda to kick ranchers off the land. TRAVIS MOSELEY: I would be breaking the law. Livestock grazing is a recognized use of national forest systems. And until that law changes, it's my job to allow for that. SIEGLER: Moseley does believe the ranchers are getting squeezed, but he blames it on an explosion of recreation on public lands recently - hikers, hunters, off-road vehicle enthusiasts all clashing with cattle herds and endangered critters. There's just a lot more pressure on the land. MOSELEY: It feels like there is more of that polarization and less tolerance for each other's interests in how they use the National Forest, whether it's for wildlife viewing or livestock grazing. SIEGLER: In New Mexico, the ranchers' frustrations are a slice of some of the broader economic anxieties you see in rural America right now. Their world is changing fast. SHIRLEY STONE: I'll show y'all this here. SIEGLER: In the town of Weed, some afternoons, 83-year-old Shirley Stone likes to put on old bluegrass recordings she used to make with her friends. Shirley is Gary Stone's mom. SIEGLER: The fiddle tunes are a reminder of better times when hundreds of people lived here, working at the saw mills and the ranches. Today, a lot of ranching families like hers have left. All the mills closed. So did the school. S. STONE: It just nearly died (laughter). We lost our school, and it just nearly died. 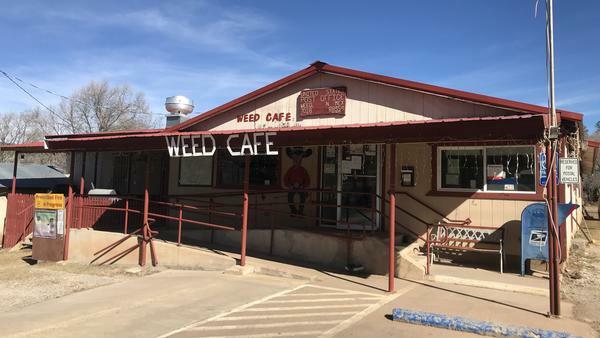 SIEGLER: What happened in Weed is an all-too-familiar tale for rural Western towns that sprung up around a once-reliable supply of lush range land and timber. S. STONE: There's not any jobs, you know, around up here much to draw people to come in, the young ones especially. SIEGLER: Folks worry if the last of the cattlemen go, so goes what's left of their tightknit little community. Kirk Siegler, NPR News, Weed, N.M.
(SOUNDBITE OF URBAN NERD BEATS' "PANORAMA") Transcript provided by NPR, Copyright NPR.